LAS CRUCES, N.M. – The New Mexico State softball team will play 10 games this season versus teams that are ranked in the recently released USA Today/NFCA (National Fastpitch Coaches’ Association) Preseason Top 25 Poll. Seven of those games will be at the NM State Softball Complex, beginning with a matchup against No. 18 Nebraska during the season-opening Hotel Encanto Invitational. “We have always played a high-caliber schedule when possible as it mentally and physically prepares us for conference,” Aggie head coach Kathy Rodolph said. “This year is one of the toughest pre-conference schedules in the 40-year history of our program. I believe with our senior experience and young talent we should greatly benefit from the challenge." NM State and the Huskers, who finished 2014 with a 44-18 record and ranked 16th in the country, will meet on Friday, Feb. 6, during the second day of the Aggies’ opening tournament. The Aggies also host 21st-ranked Tulsa in back-to-back days during round-robin play at the NM State Softball Complex on Friday, March 6, and Saturday, March 7. Rounding out NM State’s home slate versus ranked opponents will be doubleheaders against both No. 14 Arizona and No. 16 Arizona State. The Aggies and Wildcats will play their doubleheader on Saturday, March 21, beginning at 4 p.m. Arizona finished 44-16 a season ago and, as at the start of this season, was ranked 14th at the end of last season. Arizona State, meanwhile, wrapped up 2014 with a 46-12-1 record and a 17th-place ranking. The Sun Devils come to Las Cruces for a doubleheader on Monday, April 6, also beginning at 4 p.m. The two meetings will actually be the second and third meetings this season between the two teams as the two squads will meet earlier in the year in Tempe, Ariz., during Arizona State’s home tournament, the Diamond Devil Invitational. The first meeting will happen on Sunday, Feb. 22. NM State will begin the Diamond Devil Invitational by matching up with No. 15 Minnesota, which like Arizona and Nebraska had 44 wins in 2014, on Friday, Feb. 20. Another 44-win team from a season ago is 25th-ranked DePaul, which the Aggies will meet a week later on Saturday, Feb. 28, in Las Vegas, Nev., during the Alexis Park Resort Classic hosted by UNLV. Also participating at the UNLV tournament will be Wisconsin, which NM State plays twice during the tournament. The Badgers earned votes in the USA Today/NFCA poll but finished just outside the top 25, which potentially means that the Aggies could play 12 games versus top-25 teams by the time the UNLV tournament rolls around. Rodolph and her New Mexico State softball team kick off their preseason with the Dining at the Diamond event on Saturday from 4-6 p.m. The event will include hors d’oeuvres, gifts, a silent auction and an opportunity for fans to test out their softball skills. An ultimate fan experience will be part of the evening, as guests will get a chance to get on the field with the team and see how far they can hit, throw and run while running drills with the girls. Cost for individual fans to attend the event is $25 per person. There is also a table option for $500. The table option includes seating for six people and also includes a sign for your company or organization on the outfield wall throughout the 2015 season. To sign up for the event please visit www.aggieathleticclub.com/diningdiamond. 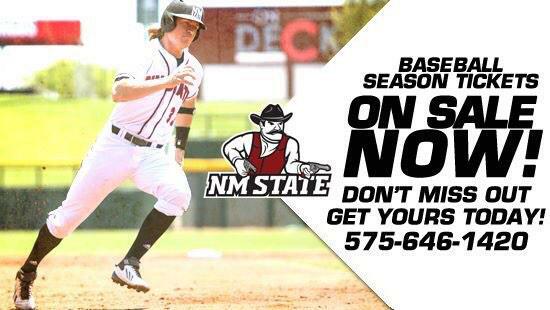 For more information fans can contact assistant coach Kate Malveaux at ksingler@nmsu.edu. NM State kicks of its season by hosting two tournaments, beginning with the Hotel Encanto Invitaional, Feb. 5-8, followed by the Troy Cox Classic, Feb. 13-15.